Slicer3 is a new plugin for Google Sketchup from TIG. It allows you to slice an object into pieces that can be cut and re-assembled into the part drawn in Sketchup. This would be great for a laser cutter. In high school I did several architectural models and cutting the terrain was fun (for a while), but always very time consuming. This tool would have saved me many hours of cutting and one nasty cut to my index finger. 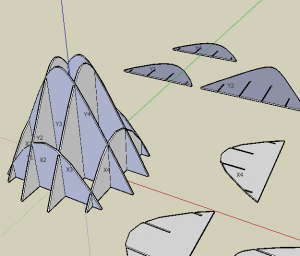 Here are some images from the Google Sketchup blog that show some terrain being sliced in 3 different ways. 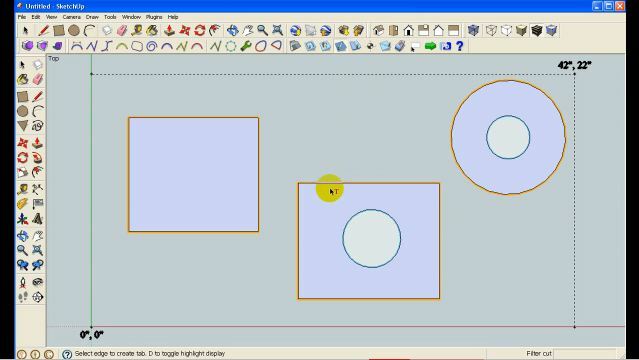 This is a plugin for Google Sketchup that generates G-Code from 2D drawings from the folks at Phlatboyz.com. It is very limited in what it can do, but many people will like the familiar interface of Sketchup. Below is a video of what it can do. The code is open source and can be obtained from their forum here. You need to register on the forum. 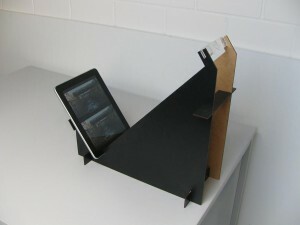 Thomas Kumlehn of Pixel Partner sent me a nice email regarding the iPad Chair. 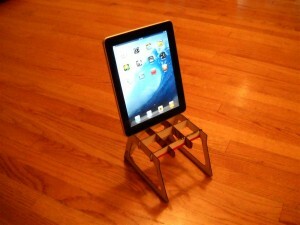 He did a roughly similar Instructable to mine on an iPad 3-D viewer. This is another laser cut flat-pack iPad holder, but this holds the iPad in the perfect location for viewing stereoscopic 3D images and video. He uses a readily available lens the redirects your vision to over under pairs. The iPads portrait mode works very well for this. I remember as a child, a friend had a vintage side by side stereo viewer with a bunch of black and white pictures for it. I remember how amazed I was by them. He has files available for cutting on his web site. I am working on a fun, geeky project and I needed a little stand for an iPad. I am not a real fan of the Apple company, but my wife got this though work and it will be perfect for my project. I love this flat-pack style of construction and I was inspired by my recent post on SketchChair. So I decided to make a little chair as my stand. I started out by downloading the SketchChair software. I was able to create a lot of cool chairs, but I could never get exactly what I wanted. The software is a great concept, but it was not quite ready for what I needed. I switched over to my 3D CAD package (Pro/E). I stole a lot of the construction techniques in SketchChair, but modeled it in exact scale in Pro/E. The design only uses four distinct pieces: 2 Sides, 2 Center Pieces, 6 Slats and 1 rear leg brace. 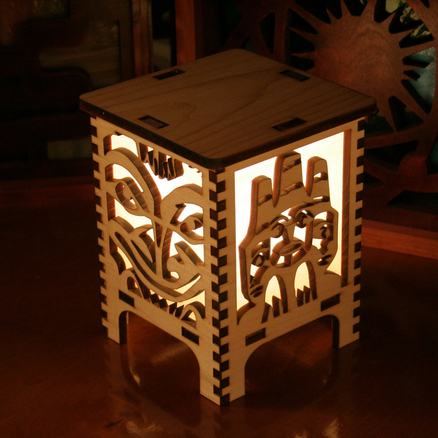 I exported the the drawing of the pieces via DXF (DXF Is here) to my Vectric Aspire CAM program. Here I duplicated the parts to what I needed and used the nesting feature to fill the cardboard size I had. 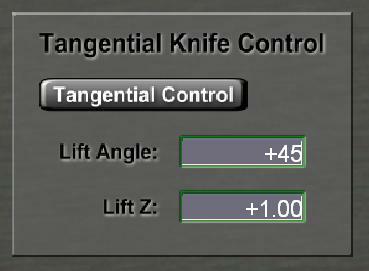 Normally I would restrain the amount of rotation allowed to keep a consistent grain direction, but this time I let it rotate any any angle (screen says 45deg, but I actually used 5deg). I wanted the finished product to look sort of cattywampus. In one of my favorite posts about the Sketch Chair software, there is a video demonstrating the software. 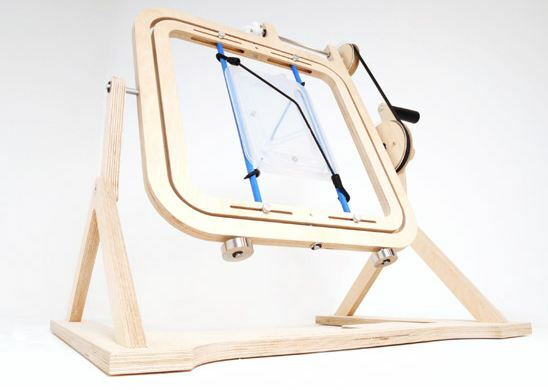 The presenter uses a little automated paper cutter to make a scale model of the chair. I started investigating the paper cutter and found that they cost anywhere between $150-$250 for the size they used. 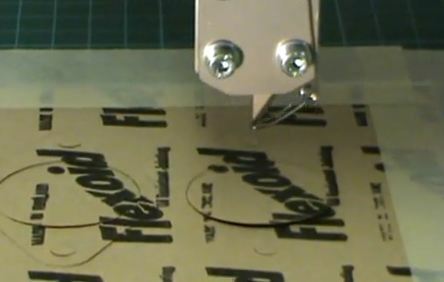 That was more than I wanted to spend considering most CNC routers like mine can be fitted with a drag knife and do the same thing for a lot less. I saw this over at Boing Boing. They are by Curious Custom and are for sale in the Makers Market. It is a really nice example of laser cut wood. Unfortunately, I don’t think my laser is quite up to this thickness. I live in a Bungalo with American Craftsman / Arts and Crafts style furnishings. This would fit in just fine. They are a good price at only about $30 USD. I am just amazed, and I am not easily amazed. 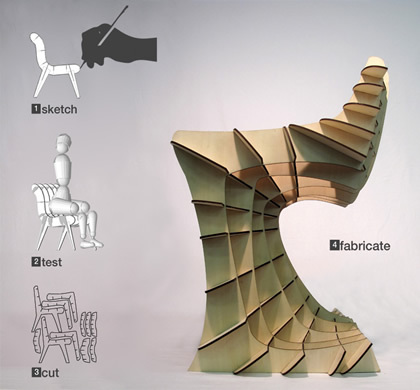 I saw this SketchChair application at the Ponoko Blog. This is just plain amazing. I love Flat-pack and this is like Flat-pack crack. This program is a collaboration between Greg Saul and the JST ERATO Design UI Project in Tokyo. 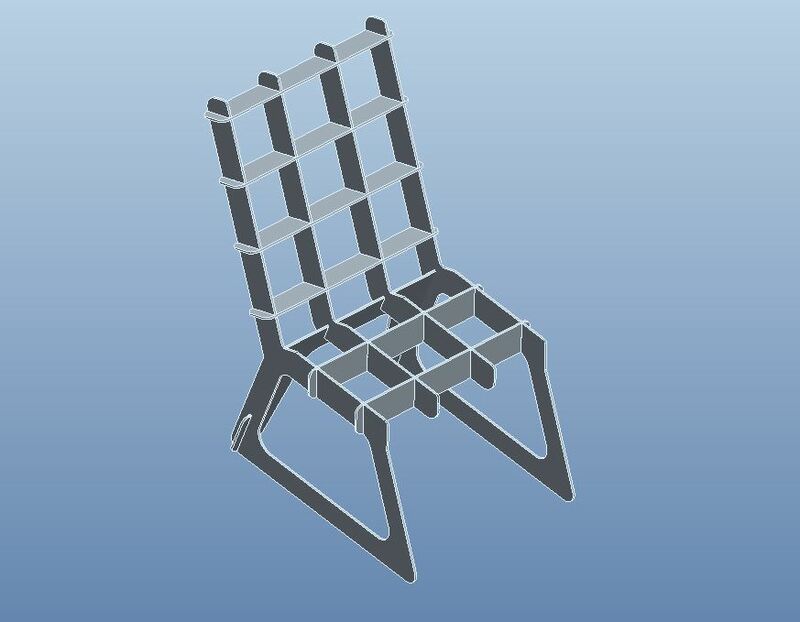 This is a Processing based program that allows anyone to simply sketch a chair and the program generates the parts required to build it in real time. The parts are ready to be cut on a CNC router or laser cutter. You really need to watch the video. It is really fun to watch. The program even allows real world physics to be applied to the chair, to see how well it will stand up on it’s own and when a human sits in it. I saw this rotational molder a while back on several blogs (Ponoko, Core77, designboom). Rotational molding is typically used to make large hollow plastic parts. They make anything from kayaks to gas tanks. The molds are very simple hollow cavities, that split into at least 2 pieces. A specific amount of material is placed inside and the mold is heated. When the material is in a liquid state. 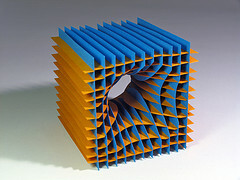 The mold starts to rotate in 3 dimensions so the material evenly coats all the walls. The material in allowed to harden and the mold is split apart. You now have a seamless hollow plastic part. 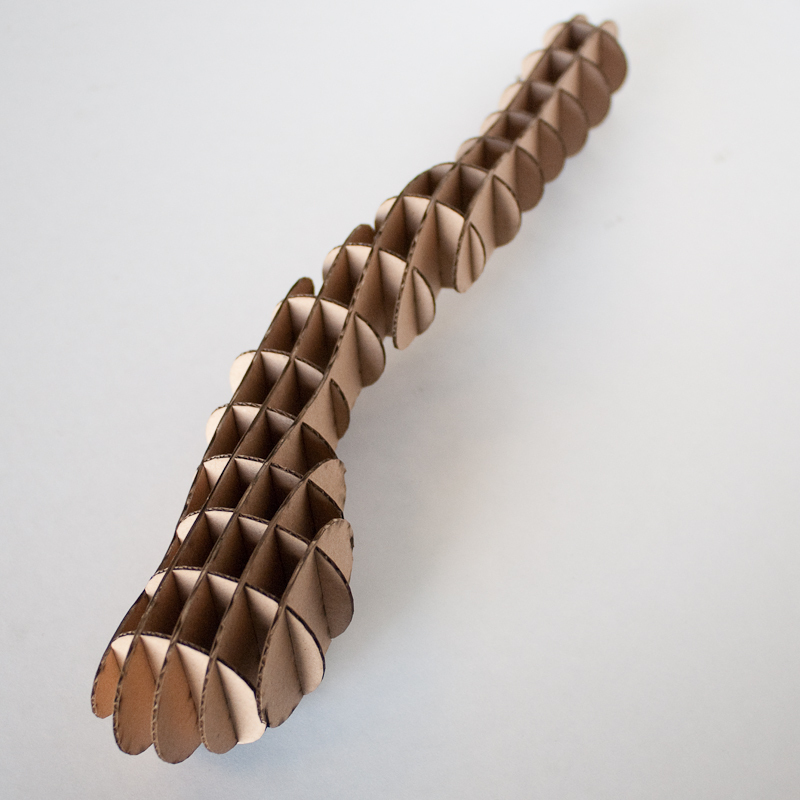 It has a parting line, or flashing, but the part is essentially seamless. 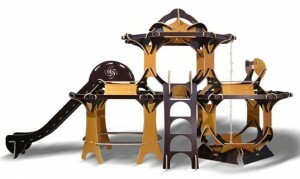 This machine is a beautiful example of flat-pack design. There is very little waste material. This version ditches the heating step and uses cold set resin. They recommend a two part resin called ‘Easy flow 120′. It is available at Mouldlife. It comes with a sample mold and you are on your own for the next one. It looks like the mold was vacuum formed. I saw this flat-pack inspired inspired playhouse over at inhabitots. 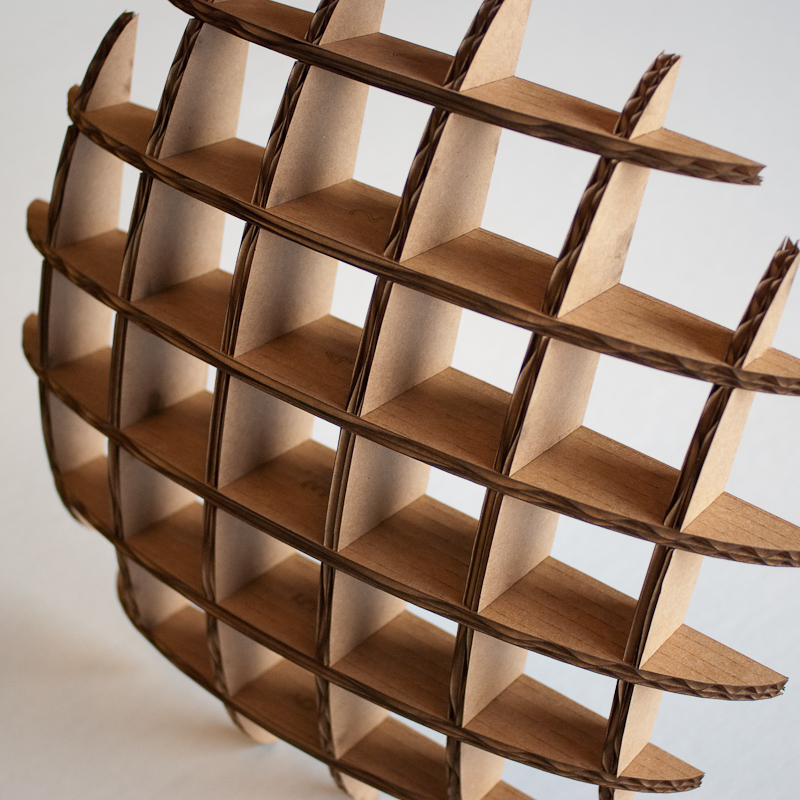 Flat-pack is a form of a Ready-To-Assemble (RTA) product that ships in a flat state. 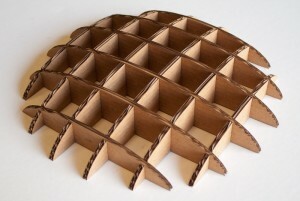 The latest flat-pack craze is to see how efficiently you can pack the pieces into the raw sheet. 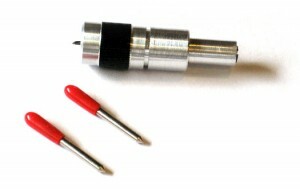 The parts usually can be assembled without fasteners. Gregg Flieshman has taken the look and assembly features to the extreme and produced some amazing designs. I was originally lured in by the playhouses, but some of his furniture is even more fantastic. The concept is perfectly suited to home router and laser folks because everything is done in the flat and there are no need to expensive, hard to get fasteners. This is a handy Plug in for Google Sketchup. 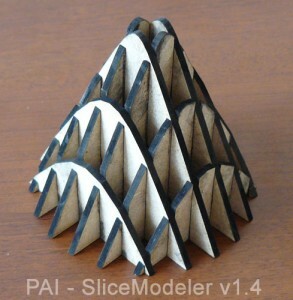 It slices a solid model so it can be cut on a laser cutter or router. It is called SketchUp SliceModeler. You can get it here. It costs EUR 10. Here is a tutorial for using it. You are currently browsing the Buildlog.Net Blog weblog archives for the Flat-pack category.